Cavolo Nero is a cousin of kale and is used in many traditional Italian dishes from soups to pasta, and as a side dish. 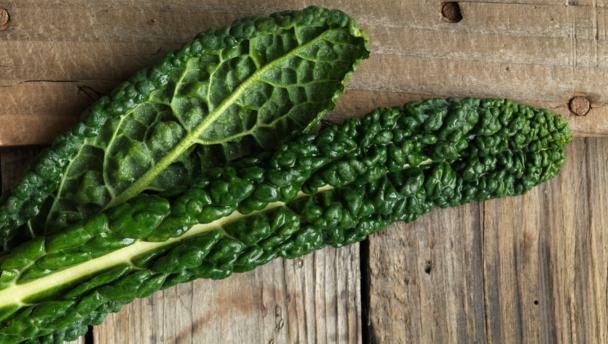 In Italian Cavolo Nero translates to ‘black cabbage’, and has a lovely dark green colour. It tastes a lot like spinach crossed with cabbage but has a nutty after taste. Unlike some leafy vegetables, you can eat both the leaves and stems, although the stems require a little longer to cook. Remove the leaves from the stems and wash in cold water. Slice stems very fine, and then sauté in a large wide shallow pot with olive oil, garlic and salt. Add a little water, place the lid on and turn down to low for 10 minutes. Add the leaves and put the lid back on for a further 5 minutes. Drain off excess liquid and serve with lemon wedges. We are currently serving this delicious vegetable with our gnocchi dish, as well as making it into a fritter with chickpeas for our spatchcock. This entry was posted in Andy’s Tips, Locale Recipes and tagged cooking tips, healthy, italian cooking, italian leaves, recipe.